The Supreme Court of Justice decided Thursday that Mauricio Macri’s government must hold public hearings before cutting energy subsidies and hiking residential utility rates. 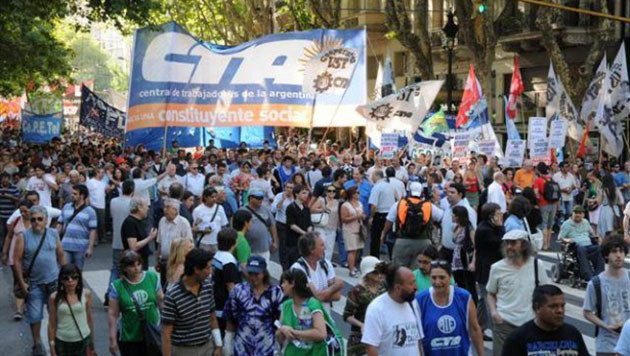 Both the CTA Autónoma and the CTA de los Trabajadores celebrate this ruling as a victory of the battle carried out by the Argentine people against these increases led by Macri’s administration. The ongoing protests allowed the high court to hear people’s demands and to act in favour of workers and the people in general. In this sense, we believe it is appropriate to continue carrying out other actions to demand for such public hearings to be binding and that the result of these hearings be in favour of all the users affected by the measure. We also believe it necessary for this decision to be as well for SMEs, local clubs and theatres among many others which, in this scenario, have been left completely helpless and unprotected. We are not willing to comply in silence with this trampling of people’s rights while the government benefits oil companies and large economic groups. This is why both the CTA Autónoma and the CTA de los Trabajadores are calling a demonstration throughout the country on September 12, in parallel to the public hearing taking place that day, to make our voice heard.